This prize monograph was a pioneering work among Marxist philosophers, East and West, twenty-five years ago. To our mind, the work would have been received with respect and pleasure by philosophers of many viewpoints if it had been known abroad then. 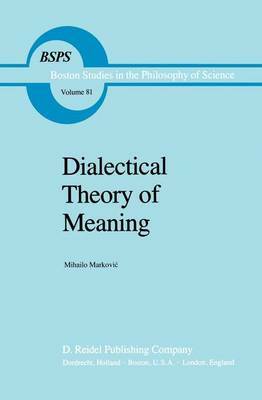 Now, revised for this English-language editiJn by our dear and honored colleague Mihailo Markovic, it is still admirable, still the insightful and stimulating accomplishment of a pioneering philosophical and scientific mind, still resonating to the three themes of technical mastery, humane purpose, political critique. Markovic has always worked with the scientific and the humanist disci- plines inseparably, a faithful as well as a creative man oflate twentieth century thOUght. Reasoning is to be studied as any other object of investigation would be: empirically, theoretically, psychologically, historically, imaginatively. But the entry is often through the study of meaning, in language and in life. In his splendid guide into the work before us, his Introduction, Markovic shows his remarkable ability as the teacher, motivating, clarifying, sketching the whole, illuminating the detail, Critically situating the problem within a practical understanding of the tool oflanguage.